Entry Deadline: November 29, 2019. The 2020 Syllabus will be available for viewing shortly and registration will open on September 3, 2019. Each year, we need more than 400 volunteers to ensure the Festival runs smoothly. Sign up today to help during this year’s Festival, taking place February 18 – February 28, 2020. The 2020 Dance Syllabus will be available for viewing soon! The results from the 2019 music festival will be posted as they come in. The list of Winners of our National Provincial Qualifying Classes can be viewed here. The Schedules for the 2018 Music Festival can be found here. Need directions to the music festival’s venues? All location information can be found here. 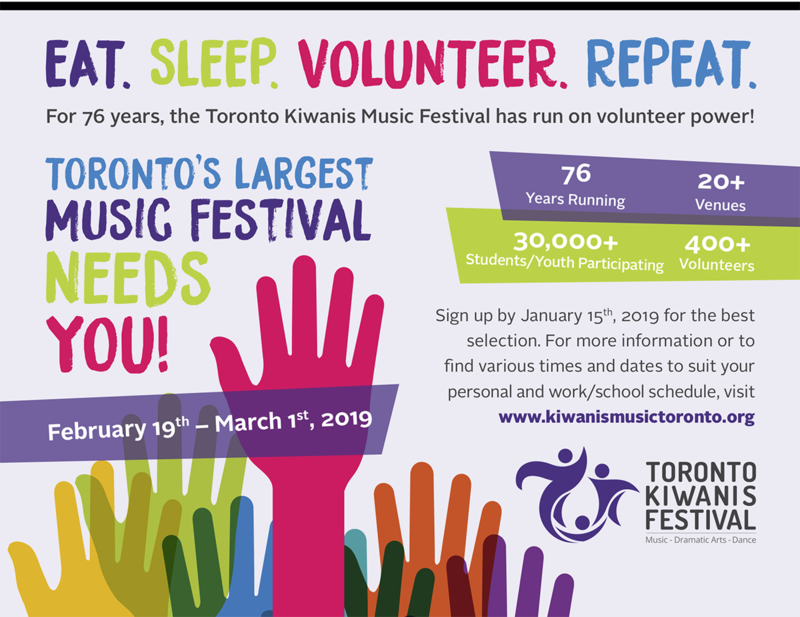 Hear from some of the Toronto Kiwanis Festival’s participants about their experience participating in the Festival and the joy it brings them. The Festival runs on volunteer power! Each year, we need more than 400 volunteers to ensure the Festival runs smoothly.